Ethel Hennesy had written on the back of the photo that this was the first restaurant owned by James Leon Hennesy, the father of E. E. Hennesy. It was in Franklinton, Washington Parish, LA. 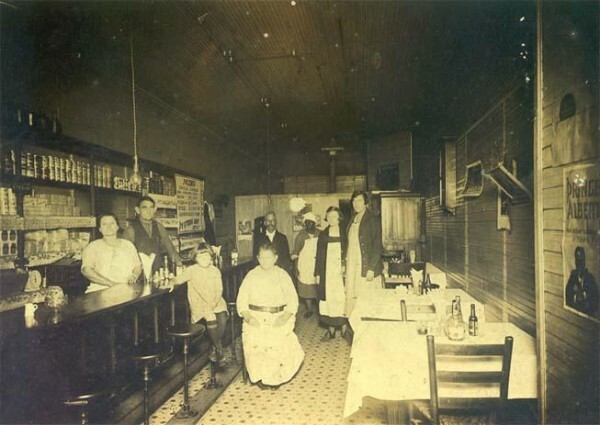 James Leon stands behind the counter with Della Nobles Hennesy, his third wife. Lucille, his child by his second wife, Lucinda Ponds, is seated on the stool. Her birthdate was 19 July 1920 so perhaps the photo is from about 1928. The African-American woman in the background is perhaps the cook and I imagine the kitchen is to the rear, behind the partial wall. The two women on the right, with jackets on, were probably waitresses. The man in the background was perhaps someone employed as something like a bar keep, toting and doing some of the heavier work? The woman seated beside Lucille looks like she would probably be a relative since she is to the fore. There is a small window to the right that is open and one can tell that it is dark outside, so the image was either made early morning or at night, before or after the work day. An ad for Prince Albert is on the wall. One gets a good feel for the work environment from the photo, the division of responsibility, and it seems that the restaurant probably also functioned as a store. I can imagine Lucille getting out of school and going to the restaurant to sit while Della and James worked the counter. Two waitresses seems like a lot for such a small restaurant but perhaps without certain modern conveniences like dish washers there was more work entailed. However, Della’s first husband ran a restaurant, which is no doubt why she looks as confidant as she does. She knew the business. I would like to have your permission to use your photo in our 150th Anniversary of Franklinton.